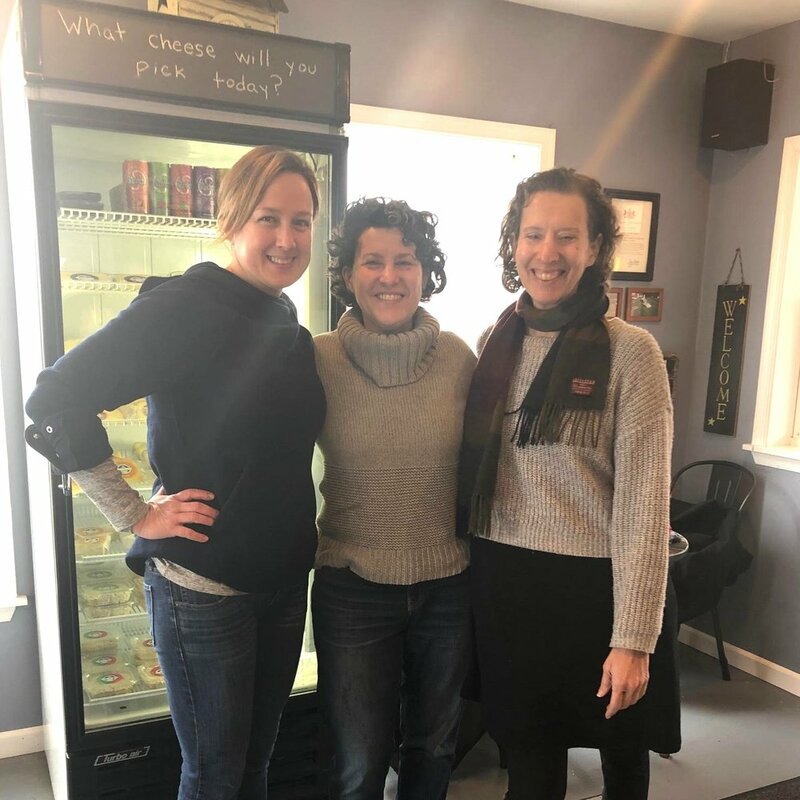 Me (center) with Emily Montgomery, cheese maker at Calkins Creamery (left), and my sister, Caroline Karlen. I came to this business as an eater, as many do. And my love of food grew into a passion for agriculture and became my life’s work – instigating the rise of the local food movement in Philadelphia, supporting the preservation and growth of our region’s farms, and, nearly 20 years later, launching Third Wheel Cheese Company. It began in the late 90s for me, a moment in history when people were beginning to understand the health and environmental benefits of organic and sustainable growing practices. A ground swell across the country occurred as many of us looked around and realized: if we don’t support small-scale local farms, we won’t have small-scale local farms. I wanted to preserve a thriving agricultural system in our region – and get to enjoy the diverse, sustainable, delicious, wholesome food those farmers produce! Starting as a volunteer, and later co-founding Fair Food in 2000, I felt called to work on behalf of these family-owned farms to help capture a market share that was slipping away to industrial farming. These growers needed advocates, but they also needed a market – public awareness that fed a desire for local food – and easier access to the customers who wanted to support them. Through the collective action of Fair Food, local advocates and volunteers, and several key organizations, we launched Philadelphia’s local food movement. As the Executive Director of Fair Food from 2000-2017, I opened the Fair Food Farmstand, Philadelphia’s first all-local retail grocery store, in the Reading Terminal Market; launched Philly Farm & Food Fest, the region’s largest one-day food and farming festival; and made hundreds of meaningful business connections between farmers, food producers, chefs, retailers, institutions, and distributors. Those one-to-many connections are what I am most proud of – when I could introduce a farmer to a chef, a supplier to a retailer. Conversations that seemed small at the time often made the largest impact over the years in a farmer’s business. Nearly two decades later, I still work with many of the farmers and chefs I met and connected. 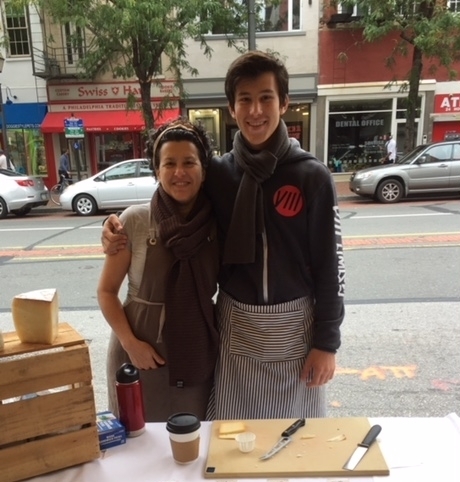 Me and my son, Caleb, at the High Street on Market farmers market. What excited me most in those early days remains what brings me the most joy and satisfaction today: being a part of the supply chain. This was the inspiration to start Third Wheel Cheese Company in 2018. I missed playing a hands-on role, making an impact on dairy farmers’ sales and marketing, and bringing their exceptional cheeses to the restaurants and retailers I admire most in Philadelphia. Today I am delighted to find myself an essential cog connecting two groups I greatly admire: farmers – who inspire me endlessly by their spirit of perseverance, their stewardship of their land and animals – and the chefs and retailers who possess the creativity and grit to build thriving small businesses here in Philadelphia. I started Third Wheel Cheese Company to make it easy for restaurants and shops to offer a real selection of exceptional regional cheese. To achieve that promise, I provide one-stop shopping accompanied by outstanding quality and wide variety. It’s immensely satisfying to provide customer service that’s straight-forward, convenient, and adaptive to my clients’ needs. I will break wheels, provide selection support, accommodate hiccups in the ordering process, provide tastings to educate staff, and anything else I can do to solve a problem for my customer. And I’m thrilled to do it. Food and agriculture remain my passion. I value the thoughtful service you provide your customers, just as I strive to serve you in that way. And I still love creating connections that matter, supporting those I admire most, and working to make an impact – the same forces that drove me 20 years ago to save our local farms. Would you like to experience the best of our region’s local cheese? Schedule a tasting! I’d be delighted to bring a wide selection of our finest artisan and homestead cheeses to you.